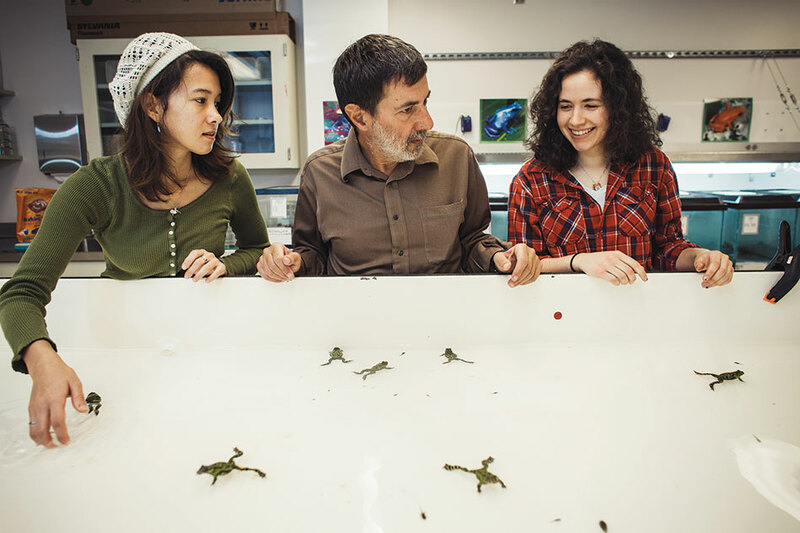 Prof. Bob Kaplan and his students probe deep questions about evolution, ecology, and the fire-bellied toad. In the summer of 1987, Chris Marshall ’89 found himself on a mountainside in South Korea with a big headache. Marshall had come to study insect life in the ponds of Tut’a-san Mountain over the misgivings of Prof. Bob Kaplan [biology 1983–]. Given the remote location and long hours in the field, Kaplan had thought the experience was best suited for juniors or seniors, but after much wheedling on Marshall’s part, he had finally relented and told the sophomore he could come. Unfortunately, it turned out that the bugs he wanted were in short supply. Marshall needed a new research project—fast—or his inaugural field experience was going to be an embarrassing flop. At night Marshall lay awake listening to the sounds of Oriental fire-bellied toads, Bombina orientalis, calling to each other in nearby ponds, and wishing he had brought along a book to read. There was no shortage of frogs (Bombina is actually a frog) by the sounds of things. The next day, Kaplan suggested that Marshall make a virtue of necessity and switch from bugs to frogs—a decision that salvaged Marshall’s summer and taught him the value of improvising in the field. He also handed Marshall Siddhartha by Herman Hesse. The slim novel of spiritual self-discovery was important to him, Kaplan said gravely, so much so that he read it again every few years. So I ask Kaplan: How many times has he read Siddhartha in the three decades he’s been at Reed? The response seems consistent with a certain fire in the belly that marks his approach to science—an approach that generations of students have come to adore, even though, during Kaplan’s time at Reed, biology has been turned inside out by new technologies and the ability to probe life at the level of DNA. Kaplan has adapted—as any evolutionist would—but only to a point. In lectures, lab experiments, and fieldwork, he insists on keeping the focus on whole organisms. It’s not that genetic wizardry isn’t fabulous. 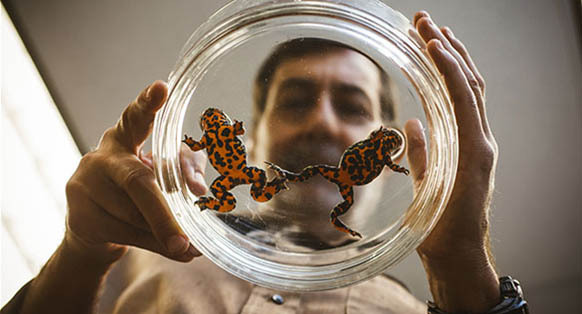 Kaplan just happens to think that when it comes to understanding the implications of a changing environment, frogs offer a unique opportunity—and warning. 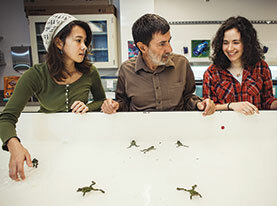 KNOT OF TOADS: Mari Cobb ’16, Prof. Kaplan, and Taylor Stinchcomb ’14 contemplate a tank of fire-bellied toads (which are technically frogs—if you need more explanation, ask a bio major). I meet him on a sunny day in October at his office in the Griffin Memorial Biology Building. Before we settle in to talk, he wants to show me the lab next door. In one room, at a long bench, Mari Cobb ’16 is at a microscope, separating Bombina embryos, which look like miniature tapioca pearls, for an experiment that Kaplan’s intro biology class will run in the Reed canyon. The source of those embryos is a warm, windowless room filled with tanks of water, where 400 inky spots of movement dart amid the gurgle of water and the hum of pumps. Kaplan is explaining how each frog was once an embryo assigned to a Reed student in the intro class. Conveniently, Bombina has a lifecyle that, with a little help from added hormones, dovetails with Reed’s academic calendar. It’s embryo to frog with a bright yellow-orange belly in just 12–14 weeks. All students can get the pleasure, familiar to any kid who ever came home lugging a bucket of tadpoles, of watching an astonishing act of metamorphosis. Upper-division students interested in more serious research make use of the Bombina factory too. Taylor Stinchcomb ’14 is an environmental studies major with an emphasis on biology. For her thesis, supervised by Kaplan, she is exploring how herbicides affect Bombina embryos and larvae. Other scientists have found that herbicides can wreak havoc on a frog’s sexual machinery. Stinchcomb is trying to figure out just how little weed killer it takes to knock the frogs out of the ecosystem. Kaplan grew up in Brooklyn. He got interested in biology the same way many of his students do—by spending summers traip-sing around in the woods and looking for critters. In his case, it was eastern red-back salamanders in New York’s Adirondack Park, which has an area larger than Yellowstone, Yosemite, the Grand Canyon, Glacier, and Great Smoky Mountains combined. It was and remains a good place to observe nature, despite the fact that it’s within a day’s drive of 60 million people. After he’d earned degrees from Brooklyn College and the City University of New York, Kaplan headed west in 1978 to do a postdoc at Berkeley’s Miller Institute for Basic Research in Science and came to Reed five years later. 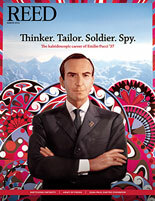 Kaplan has always insisted that research go beyond the lab. This fall, as he’s done nearly every year, he took a group of students to Wahkeena Falls, about 30 miles east of Portland in the Columbia Gorge. Headlamps are required on this nighttime hike—local amphibians, like the Pacific giant salamander, are most active after dark. During his Reed days, Patrick Phillips ’86 went on one of these trips with Kaplan. Phillips remembers holding jellied clusters of salamander eggs that looked like little translucent jewels—miniature embryos clearly visible when the beam from his headlamp was aimed just so. “It was breathtaking, just like naked biology, right there in front of you,” he says. Today Phillips is a professor of biology and associate vice president for research at University of Oregon. His lab is heavy into the modern tools of biology, including statistical genetics, DNA sequencing, and computer simulations. However, he says the basic questions in biology, the ones immediately evident to those students wearing headlamps, haven’t changed: How does that little jewel develop into a salamander? And how do changes in the environment affect its growth? Global warming poses a serious threat to amphibians, especially those that breed in ponds, because they can’t regulate their body heat. Many studies have examined the effect of rising average temperature on amphibian development, but virtually none has looked at the impact of thermal variation, where the daily highs and lows of a breeding pond spike erratically due to higher carbon dioxide levels in the atmosphere. HARDY CREW. 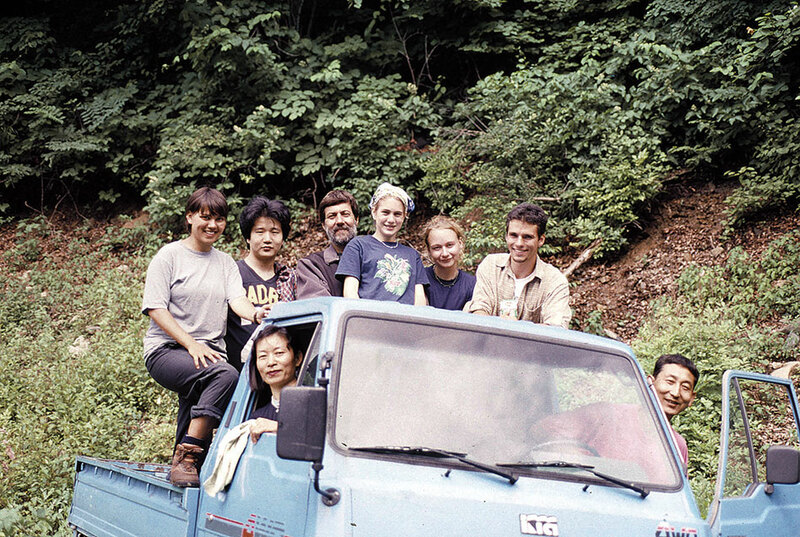 Prof. Kaplan in the field in Korea in 2002 with (left to right) Martha Baugh ’01, daughter Jessica, Lindsay Fuchs ’05, and Aaron Clark ’00. In the passenger seat is Choi Geum Sook; driving is her husband, Kim Won Ki. 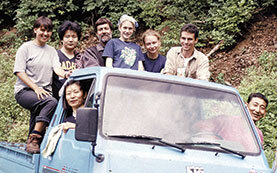 The couple have been doing ground support for Kaplan’s Korean fieldwork since 1985. In a groundbreaking paper published in BMC Ecology in May 2013, Kaplan, Phillips, and several other Reedies—Juliana Arrighi ’07, Advait Jukar ’11, and Ezra Lencer ’06—found that hotter hots and colder colds tend to produce Bombina tadpoles with longer snouts and shorter tails. Sounds like an innocuous result, unless you’re a tadpole. That longer snout and shorter tail would make you a slow, top-heavy, awkward swimmer, and thus easier pickings for predators, which, in a macabre frog-eat-frog twist, often include other amphibians. The takeaway: thermal variation is a critical factor for amphibian survi-val and can’t be predicted by simply plugging higher temperatures into a model. Kaplan has published 34 papers on evolution and ecology and helped launch the scientific careers of many Reed alumni. But it is striking how often his former students reach beyond the microscope to describe his impact on their lives. King has fond memories of Kaplan and his wife, Linda, and daughter, Jessica, coming to visit her in Kenya in the mid-1990s after she graduated from Reed. Kaplan was in Africa exploring whether Hyperolius viridiflavus, the common reed frog, might be suitable for study in his lab back in Portland. Ultimately it didn’t pan out due to onerous export restrictions. She remembers scoping out potential field sites with Kaplan, who at one point considered taking over an abandoned camp used by camel researchers. How to forget Jessica, then in elementary school and now an anthropology doctoral student at University of California, Santa Barbara, practicing her violin while hippos bellowed in the background? Or looking out over a sea of pink flamingoes at Lake Bogoria, where Ernest Hemingway had once camped? Back in Portland on a sunny fall day, I sit in the Cerf amphitheatre and look east, toward the canyon. The colors of the red alder and bigleaf maple trees are turning and reflect in the water. Behind the pretty picture is a thriving ecosystem, one that’s been painstakingly restored since the late ’90s. For years Kaplan served as chair of the Canyon Committee, and his students still do research in the canyon. This year, Jenny Balmagia ’14 is studying the canyon’s macroinvertebrates, which includeseverything from worms and snails to crayfish and dragonflies. Affection for Kaplan runs deep through the hearts of many former students. When I talk to Marshall on the phone, he’s just back from getting married on the Oregon coast. Of course Kaplan was there, and the two wound up laughing about Marshall’s first befuddling encounter with Siddhartha. Today Marshall is curator and collection manager at the Oregon State Arthropod Collection in Corvallis. He found his way back to bugs by way of Harvard and Cornell. He also found his way back to Hesse’s book, which he reread years after his Korea trip with Kaplan. Kaplan is still helping students find their way, especially down boggy, muddy trails in the dark. It’s a cold rainy day in November now, and we’re trading emails. He writes to warn me he’ll be tough to reach. He’ll be in the canyon with intro biology students all afternoon and then with upper-division students on Sauvie Island until 11 p.m that night. A protagonist, a journey, and a story about muddy boots and doing biology the old-fashioned way. Seems one that’s worth telling, and doing, more than once.